Location of East Moline in Rock Island County, Illinois. The median income for a household in the city was $35,836, and the median income for a family was $44,695. Males had a median income of $35,263 versus $23,607 for females. The per capita income for the city was $18,245. About 11.6% of families and 13.9% of the population were below the poverty line, including 20.3% of those under age 18 and 7.0% of those age 65 or over. Laurdine Patrick, jazz musician, father of Massachusetts governor Deval Patrick, was born in East Moline. Chase Hilgenbrinck, former professional soccer player who left his career in his prime to become a Roman Catholic priest, lives in East Moline. Mike Butcher, MLB pitcher, pitching coach. ^ "City of East Moline". Geographic Names Information System. United States Geological Survey. Retrieved June 29, 2013. 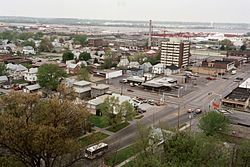 ^ a b East Moline (city) QuickFacts from the US Census Bureau Archived July 29, 2012, at WebCite. Quickfacts.census.gov. Retrieved on April 21, 2012. ^ Visit Quad Cities. Visit Quad Cities. Retrieved on April 21, 2012. ^ City of East Moline CAFR. (PDF). Retrieved on March 10, 2019.